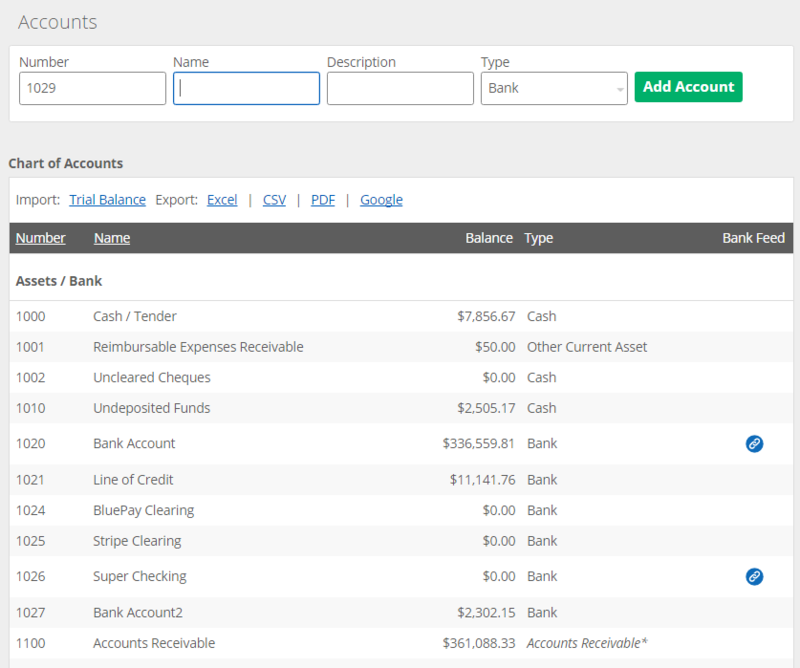 Learn what accounts are, what they're used for, and the different types of accounts. The word "account" has a different meaning in the world of accounting than most people are used to. Some of us are used to the idea of a "bank account", which is seen as a sort of "mini-vault" in which we keep our money. Others think of "account" as a another word for "client". In accounting, an account is used for recording a dollar balance and a history of changes to that balance. The dollar balance may be associated with an actual bank account, or it may represent the money owed you by a client. It might also represent income, expenses, or the value of assets that you own. A chart of accounts is simply a list of all the accounts used in your accounting system. Kashoo comes with a default chart of accounts set up for you, but since the needs of business vary from one to another, you are able to add, edit, or remove this default set of accounts. Before modifying your chart of accounts, we recommend consulting with an accounting professional. If you take a look at the chart of accounts in Kashoo (by going to Accounts), you will notice that every account has a number. Account numbers are used for two main reasons. They organize the chart of accounts. Accounts that are similar in purpose are grouped together with the same numbers. They help make data entry easier. For accountants and bookkeepers who may enter hundreds of transactions in a day, punching in a four digit number is usually quicker than typing in an account name. If the account number field is left blank when adding a new account in Kashoo, Kashoo will auto-generate one for you. The Accounts Receivable type of asset is used to keep track of money owed to the business by its customers. Unlike a bank account which contains funds you can readily access at an ATM machine, the Accounts Receivable account is full of I.O.U's from customers. When a business receives payments from its customers, the money is moved from the Accounts Receivable account to the Bank account. This is done through the Enter Payments tab in the Income page in Kashoo. The Bank type of asset is used for, you guessed it, bank accounts - Whether it be your checking, savings, or other type of bank account. The Cash type of asset can be used for accounts such as a petty cash account or an undeposited funds account. Petty Cash is used when dealing with physical cash, you know, dollars and coins. A petty cash account is sometimes used by a business for small purchases that can't be made by electronic means, like to plug a parking meter. Undeposited Funds is used to temporarily hold funds before depositing them into a bank account. Think about when you receive checks from customers. You may have five checks sitting on your desk for a few days before you deposit them into the bank. Since you did not deposit the checks into the bank right when you received them, you need some type of account to temporarily hold these funds, which is what the Undeposited Funds account is for. Once you have deposited the checks into your bank account, you would transfer the funds from the Undeposited Funds account into your Bank account. The Fixed Asset type of asset account is used for assets that will retain therir value for more than a year, like a building or a vehicle. Generally, assets in these accounts will lose value and need to be depreciated. How to depreciate an asset depends on a number of factors, such as your local tax laws and the kind of asset it is, so it's best to get help depreciating assets from an accounting professional. The Inventory type of asset account is used for assets that a business intends to sell, like paper that an office supplies store sells. When inventory is sold, the value of the asset is moved to the Cost of Goods Sold (COGS) Expense account. The Other Asset type of asset account is used for assets that will not be converted to cash or used up within a year. Examples would be things like goodwill or patents. The Other Current Asset type of asset account is used for assets that will be converted to cash or used up within a year. Don't let the Pre-Paid Expense type of asset fool you. It's an asset account, not an expense account. Expenses that are paid for in advance, like insurance for the year, are assets to a business. So, using the pre-paid insurance as an example, a typical business may start off the year with $1,200 in the pre-paid expense insurance account and every month move $100 from that account to the insurance expense account so that the cost of the insurance is applied evenly to the business's Profit & Loss statement throughout the year. A Liability is something that a business owes money for, like a loan, credit card, or a vendor bill. The Accounts Payable type of liability is used to keep track of money that is owed to its vendors. When a business pays its vendor bills, the money is moved from the Bank account to the Accounts Payable Account. This is done through the Pay Bill tab in the Expenses Page in Kashoo. The Client Credit type of liability is used to keep track of money that a business owes to its customers. This account would be used for situations like when a customer pays a deposit on work to be done or when a customer overpays an invoice and has a credit with the business. The Credit Card type of liability is used for purchases done by business credit card (as well as payments made to the credit card). The Long Term Liability type of liability is used for debts that a business has that will last longer than a year, like a car loan. The Other Current Liability type of liability is used for debts that a business has that will be paid within a year, like a line of credit. The Taxes and Remittance type of liability is used for money owed to the government for things such as sales, income or payroll taxes. Equity is perhaps the trickiest type of account to understand. Equity is the value of Assets - Liabilities. Equity represents the money that has been invested into, made, and taken out of a business. Equity accounts that you may be familiar with are Owner's Equity, Retained Earnings, and Dividends. Retained Earnings is a special type of Equity account that is created by default and cannot be deleted. Income (a.k.a. Revenue) is the money that a business receives from its normal business activities, like selling goods and services to its customers. Expense is the money that a business pays to conduct its normal business activities, such as paying for rent or office supplies. The Cost of Goods Sold type of Expense is used - as the name implies - when goods are sold to a customer. For example, if something in inventory worth $5 is sold to a customer, that $5 is moved from the Inventory account to the Cost of Goods Sold (COGS) account. The Expense type is used for any expenses that are not Costs of Goods Sold.